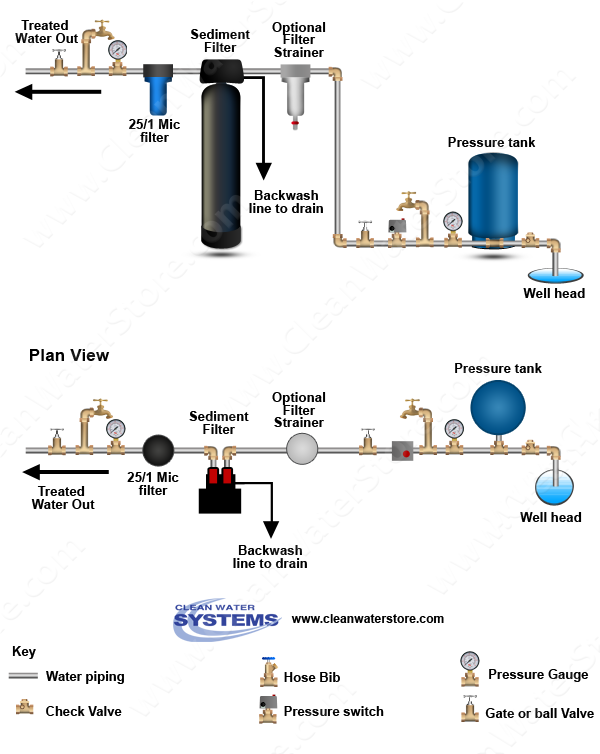 Clean Well Water Report: Which Well Water Filter System? Which Well Water Filter System? 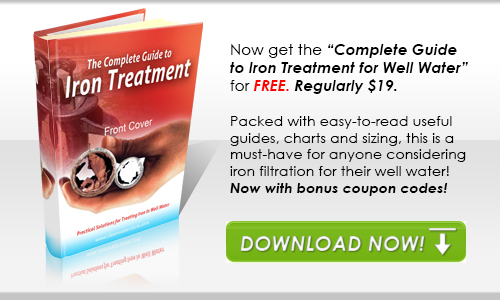 My question is: which well water filter system is best for my well water? I do not have iron or rust stains, but we do get a lot of grit and sediment. Every 2 -3 weeks I need to change the filter on our main line coming. The filter is a GE whole house filter and I have tried different cartridges. I think we are using a 5 micron one now and it works fine. It fills with some sand, but mostly fine sediment of some kind. While it might work OK, it does not last long. Is there a different type that lasts longer? Thanks for emailing. In regard to treating sediment there are a couple of options depending on the levels of material coming from the well. To determine the best method moving forward I recommend a bucket test and run the water into a 5 Gallon Bucket straight from your Pressure Tank. Then using a Stopwatch time whatever settles to the bottom in 3 minutes or less. Whatever settles out in that time can use a Centrifugal Sand Separator. There are a couple types of separators available depending on the application, I’ll start with a straight forward model typically ideal for a residential application treating between 10 – 20 GPM however we do offer both larger and smaller sizes as well. These do not reduce the water pressure and have no filter element to change. Note these are sized by well output, not the pipe size in order for proper operations. Now let’s take the bucket test again and say that hardly anything settled out. In that case we would recommend a backwashing Sediment Filter instead. The high purity natural mined Zeolite ChemSorb media filters and removes rust/sediment down to 3 - 5 microns. Unlike filter cartridges that quickly become clogged and require frequent changes, the Backwash Sediment Filter automatically backwashes the rust/sediment restoring water pressure. The media is easily changed and lasts for about 5 years. The following will provide images, product links, as well as additional information on both of these systems. This equipment is sized for a home with 3 – 3.5 bathrooms however smaller and larger sizes are available. NSF certified, ¾” ports, Carbon Steel construction. Ideal for removing sand and grit from well water systems. This is the only NSF certified Sand Separator on the market, and are certified safe for drinking water. Mounting bracket and purge kits sold separately. The SandMaster centrifugal separators have no screens, solid baffles, or moving parts. No maintenance is required other than periodic purging of the unwanted solids by opening up bottom ball valve (valve not included). Using centrifugal force removes 98% of all 200 mesh (74 micron and larger) particles. No screens, cartridges, filter elements to replace. Must be installed between well pump and pressure tank for proper operation. Drain line size is 3/4". 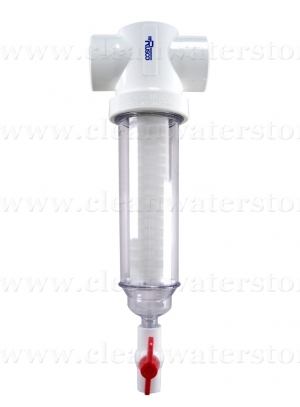 Sediment Backwash Filter 1.5 Cubic Foot, 115 Volt. 1” pipe connectors and bypass is included. All installation and start-up guides will be sent directly to you and we are available for tech-support as well should you have questions either after installed or down the line. Features High purity natural Zeolite/Chemsorb media, NSF certified. Backwash rate is 8 gpm, with max service flow rates of 12 - 16 gpm available with minimal pressure loss. Dimensions: 10” Diameter x 61” Tall with valve attached. All instructions for installation are included as well as professional tech-support should you need it during install or down the line. Excellent warranty: 10 years on the media tank; Industry leading 7 years on the control valve. Other options include a Rusco Spin Down filter, as a pre-filter to the Sediment Backwash Filter, and a 25/1 micron dual grade filter, as a final filter. Rusco Spin Down Filter 1" Pipe Size, 1" SxS Port (Slip x Slip, for PVC pipes or glued connections), 60 Mesh (254 Microns). 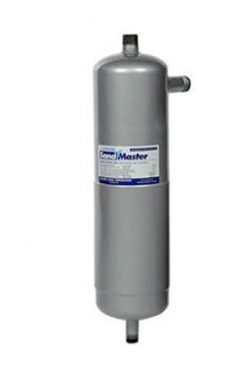 Complete Big Blue Filter Assembly, 1” inlet and up to 15 gallons per minute maximum flow rate. Excellent filter for cleaning and polishing all water for your home. 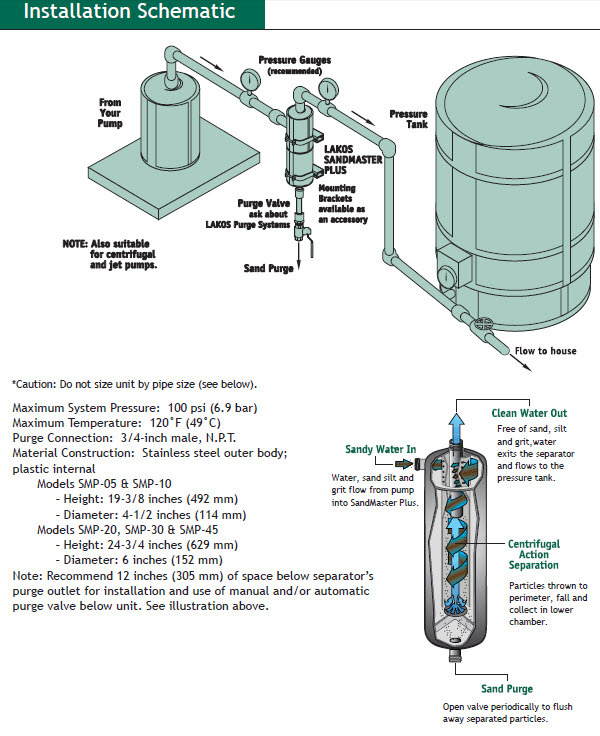 Installed as a pre-filter to a UV Sterilizer so as to insure the water is as clear as possible for proper UVT to occur. Comes with wall mounting bracket, filter wrench, one 25/1 micron cartridge, and filter assembly. Expect to change out this filter about every 6 – 9 months, cartridges cost $23.00 each. Questions? Call us toll-free 888-600-5426 or email us.